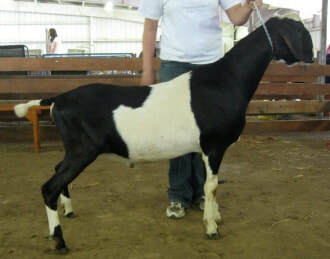 Bred to GCH +*B Sweet-Spring Calvin Klein. Confirmed bred. Due April. ​Eclipse is an amazing brood doe behind much of the stock in our herd and she is back residing in our herd! We jumped at the chance to buy her back. 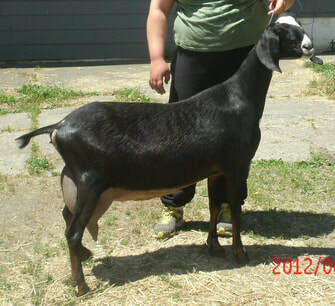 At the 2015 National Show in Oregon, Eclipse's daughters -- Tamris Farm Sola Naberrie and Tamris Farm Queen Mara Jade ---placed 10th in produce of dam. She is also the dam of Tamris Farm Sola Naberrie who placed 7th in the 3 year old milking class. She is the granddam of many of the top 10 placing does at Nationals in 2015 in our herd. In addition, her son + SG *B Tamris Farm E's Rebel Force , ELITE Buck 2017, has proved himself in another herd. Rebel is the littermate to Naberrie and SG Tamris Farm Queen Jamilla.